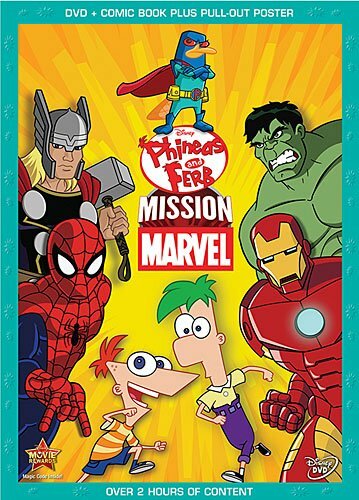 Phineas and Ferb: Mission Marvel is a single disc release containing seven Phineas & Ferb episodes including the title episode, Mission Marvel, in which the Phineas and Ferb crew team up with several of Marvel's greatest superheroes. 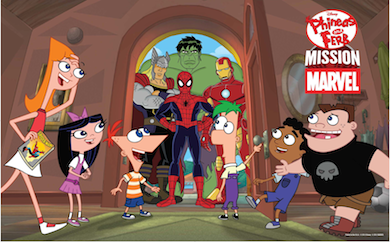 It's a cool melding of the Marvel universe with Phineas and Ferb's unique comedic style, and even has a cameo by Stan Lee. So what happens is that Dr. Doofenshmirtz builds a Power-Draininator and when fired it accidentally bounces off Phineas and Ferb's space station which reflects the beam back to earth hitting Iron Man, Hulk, Thor, and Spider-Man, relieving them of their powers. This is especially funny with Iron Man, whose power is his suit so he can't move at all and has to be rolled around on a dolly. Nick Fury thinks the beam came from one of Phineas and Ferb's inventions, but the Marvel villains know it was Doofenshmirtz, and they think is some sort of evil genius because of it, but after spending a day with him running all kinds of goofy errands they learn the truth. So then they decide to lure the powerless heroes to the mall by causing trouble there. And of course the heroes go even though they don't have their powers, though they do have Phineas and Ferb who are in their Beak suit from a previous episode and from Phineas and Ferb: The Movie. The DVD also comes with a little comic book and a fold out poster. Unfortunately, there are no behind-the-scenes or interviews with the cast or creators or anything like that, but it's still an enjoyable DVD with some pretty good Phineas and Ferb episodes.